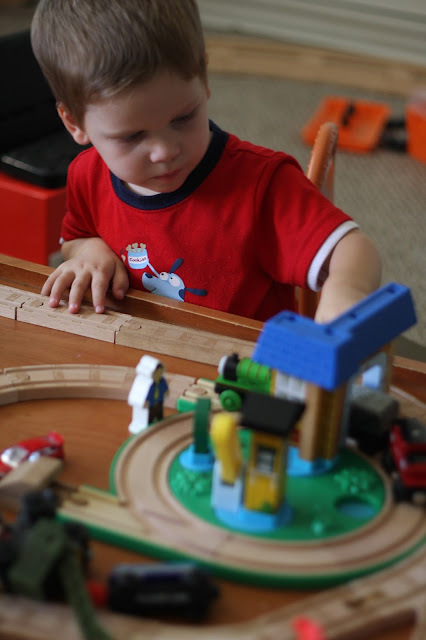 It really doesn't feel like that long ago that I was building fancy train tracks, chasing trains around town and visiting the train station for my train obsessed Connor. Thomas was his favorite thing to watch there for a while. He went through a phase where he carried one train engine with him everywhere he went. He even slept with it at night! Alas, now he is a smart mouthed second grader, who thinks most of what his mom does is wrong. But now Callum is getting into trains. 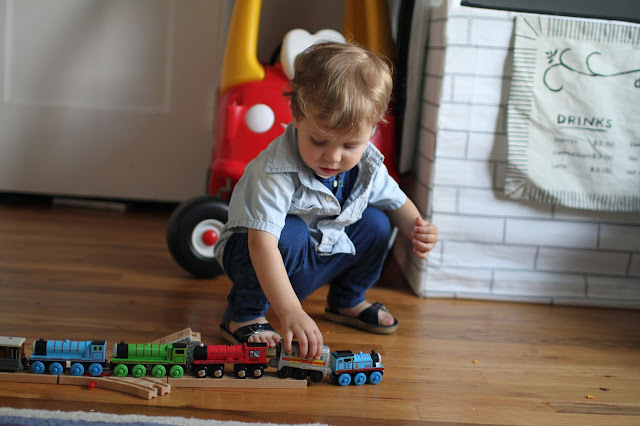 It's fun watching the same trains Connor played with getting pulled back out and played with again. And I'm back at that phase where I wonder if I should kragle (a little lego movie reference for you non lego movie watching folks) a train track together because it gets pulled apart approximately 2 seconds after I put it together. Well, actually it usually is being pulled apart while I am putting it together still. And that is always followed up with an, "Uh-oh, broken" in the most adorable toddler voice. I totally remember thinking about gluing a track together when Connor was little. I have since thought to myself, had I done it then, it would have worked out well then and now! But I have also wondered if I would have held on to something that wouldn't have been so easy to store. So many thoughts for a train track, right?! I tried going and finding a picture of Connor with his beloved koko train he always had with him, but couldn't find one. In the process, I came across these adorable pictures though. I still have those overalls and I am pretty sure we still have a train hat around here somewhere. I am thinking I will definitely need to recreate those pictures with Callum. Also seeing pictures of cute little innocent Connor, who was always my little buddy has my mama emotions all over the place now!